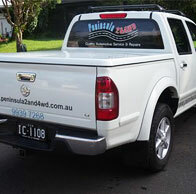 Are you looking for a reliable,value for money mechanic on the Northern Beaches? We pride ourselves in good old fashioned service, competitive and affordable prices and "taking care of your car". Your vehicle is a major investment and our team have the latest equipment and training that is needed to keep up with all new car technology. We can service your new vehicle whilst still under warranty and keep your new "Car Log Book" up to date. All cars are welcome at Peninsula 2 & 4WD. A SATISFIED CUSTOMER IS OUR GREATEST ASSET.